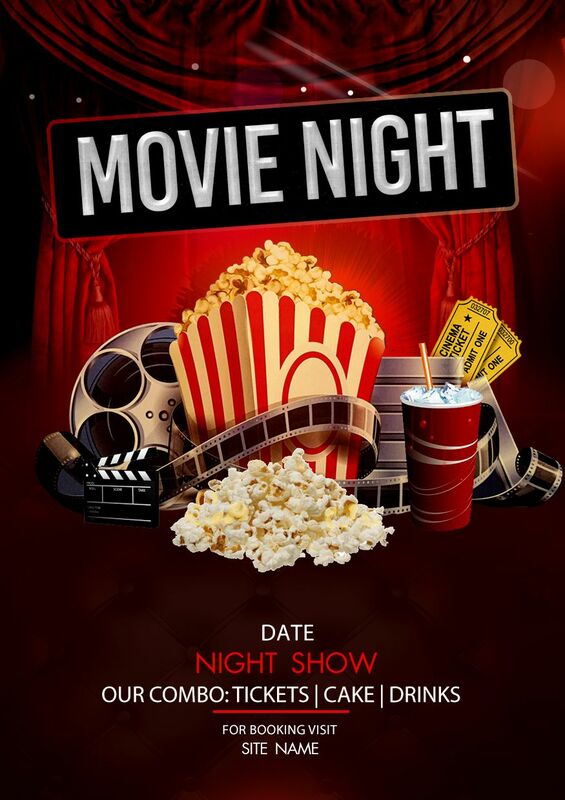 Announcing about the movie night event you’re planning to can be quickly done with the movie night flyers. Yes, flyers are easy to make and colourful to attract your entire guest. When they click their mailbox to see your flyer they will fly in the air and will feel rejoiced to join you for the movie night. Light, Camera, Action! Let us provide you with free flyers which you can edit and send via email or print and share via post. Get ready to have fun with your friends on a movie night with chilled cokes and spicy popcorn. Along with the free flyers, we will also give you some insight into what will be present in the flyer, the wordings, and how to edit and customize your flyer. 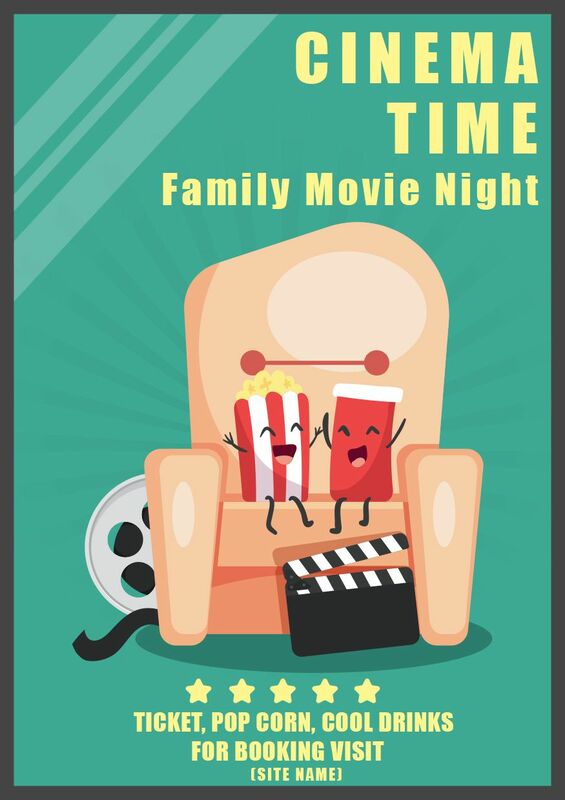 Best way to connect with families and friends without any reason is to arrange for a movie night. Get your home theatre ready and invite for a pot luck and you can eat and enjoy the show. This is time to gather little ones and horror movie together with a Halloween movie night. 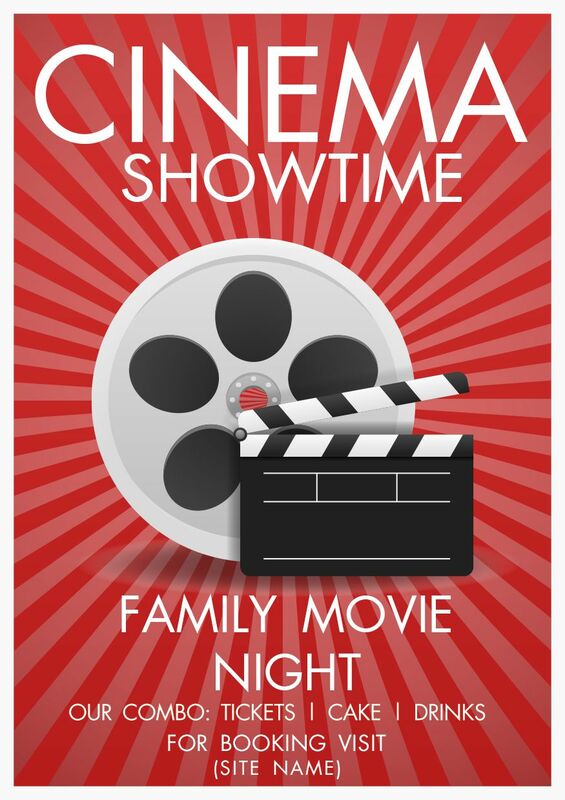 Prepare some popcorn and let all kids have a get together in the movie night. Print terrific look flyer and celebrate. The flyers can be edited using MS Word in Windows PC and Open office in Mac systems. We will provide you with ready-made flyers and you can download to your system and edit them. Let us explain you the basic elements of a movie bight flyer. You can decide the size of the flyer based on the purpose you will use it. It can be adjusted from the layout option. Even though precisely size is not a component, but, we would want to start from scratch and explain the look of a flyer. For a movie poster portrait will the ideal option. You can include some images, wordings, and the invite on the portrait size. There won’t be much of difficulty and you will have enough space to fit in all details under one flyer. This is where your editing plays a role. You can download the poster and then cut in the desired shape to provide a great look. Yes, in case you plan to share via email then go for any shape as you need not to worry about the printing and cutting part. The movie you choose to showcase to your guest can be reflected in the theme. Choose a blood red theme background and announce that it is a horror movie. Those who have a brave mind can only join and enjoy the thrill. You can use copyright free images and paste them in the flyer and again this is a step for personalization. The image will speak in a flyer and hence you need to carefully choose the image. Now, comes the next part. In this, you will have the name of the movie, the wordings, and the invite part. Movie name can be directly written or given as a clue. Wordings are optional and you can refer to the section below to know how to write the wordings. Then give the venue details where you are going to telecast the movie. You can also let know if the movie will be shown along with food or beverages etc. The wording to be printed on a flyer must be informative and funny. So remember to creatively use this section. You need not brainstorm as we have printed wordings in all-out flyers and you can use them. Additionally, mix and match the wordings from one flyer on the other and yes yours will become unique. Also, you can choose to write wordings by taking some input from the movie. Based on the movie you can provide some details and that becomes the best wording for that flyer. We have tried our best to inspire you with the 3 top wordings for different movies. Movie #1 – Toy Story 2 – Welcome all to join together and go back to our childhood days by watching Toy Story 2. Get your kids and if not possible bring some toys to really enjoy the movie theme. Movie #2 – Shadow Of Vampire – Imagine if you are in a place where outdoor reminds you about vampires? That’s exactly we will do tonight. Come and make your blood freeze in terror by watching the shadow of a vampire. Movie #3 – While You Were Sleeping – Do you have a crush as she has on Peter. Yes, a complete stranger on whom her crush grew. Let us all enjoy this romantic movie with our spouse, GF/BF. Come the party is on. You can quickly distribute the flyers via email, or in person. Also, displaying them in public can happen without much time and efforts. In short, it is the best way to reach an audience with less expense. Cost effective way to print many flyers I different colour and design. All changes can be done within one click and can send to any number of people across the world. A marketing campaign can be done effectively with these flyers. 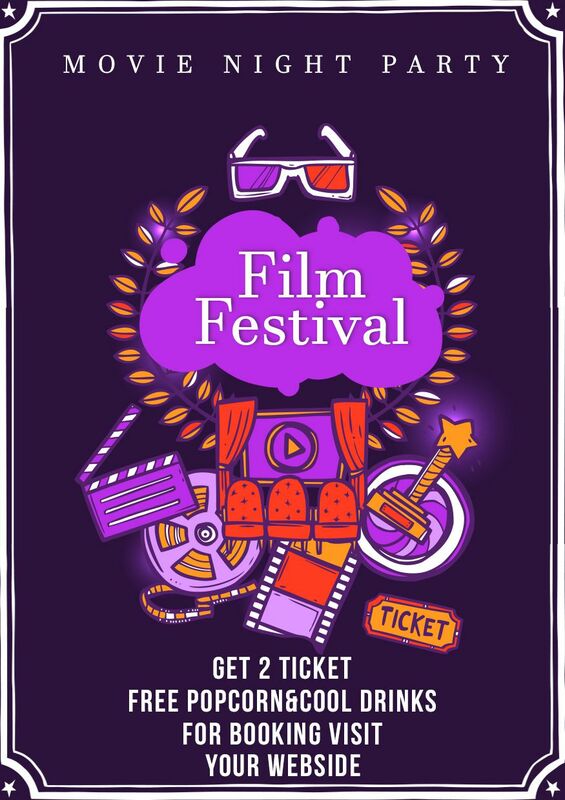 The beautifully designed purple movie night flyer with lights, camera, reel, and popcorn gives a great theme to it. Use it and let know your guest that you will book tickets and they can simply come to watch a movie and eat popcorn. 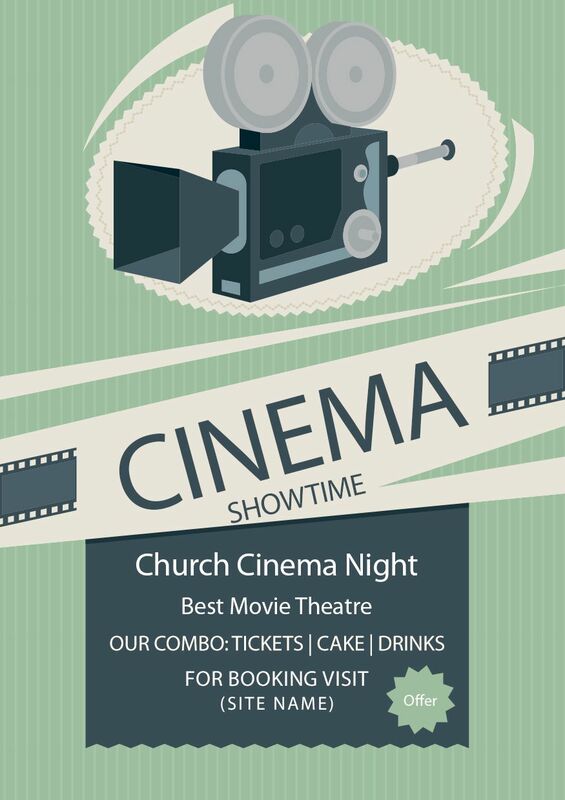 Best movie night flyer for celebrating with the church community. The green coloured poster gives a pleasing look and the ticket also mentions a free cake and drink. The cinema camera with two reels looking like two eyes is a really good animation matching the theme. 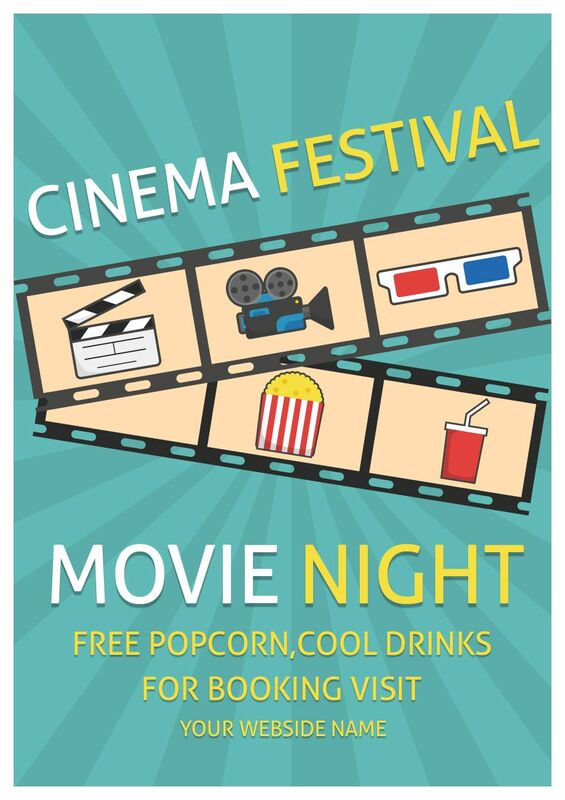 The green background with a bright chair filled with coke and corn is the best flyer for a movie night event. The reels are silently popping from behind and the five golden stars are shining. Make use of these flyers for your office movie night. The simple and elegant red background cinema showtime flyer looks great. The huge reel placed in the centre makes it look a real one and adds value to the flyer. 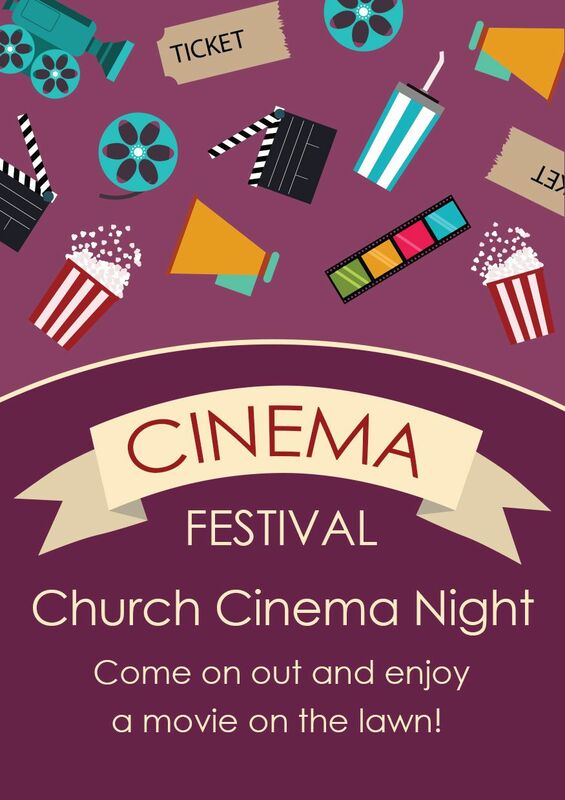 Ideal for a church movie night. Beautiful snow themed flyer looks awesome. Lovely colour combination with the wordings frozen movie night lets us know that it can be ideally used for a Christmas or New Year Eve movie night. Also, horror movie name that freezes your blood can be printed on this flyer below frozen movie night. 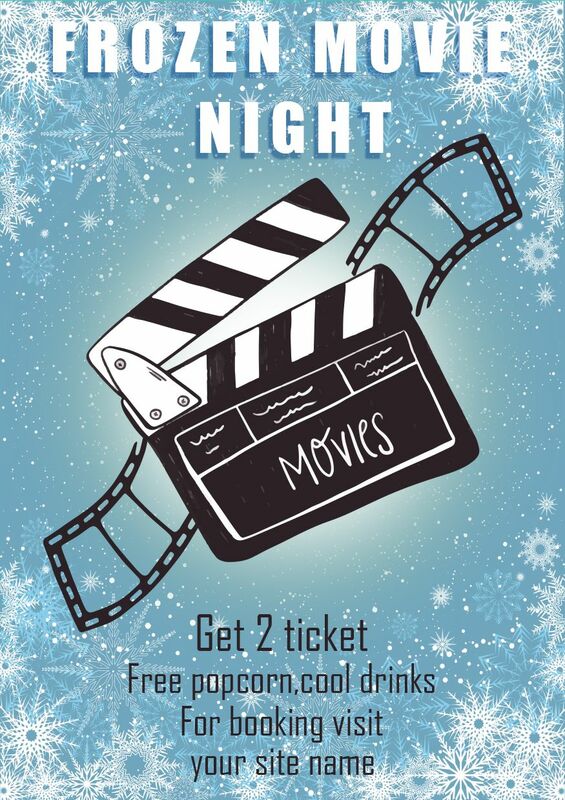 The green background with white colour wordings frozen movie night looks awesome for a cool movie night event. This is nice for a couple to book a ticket online and grabs their cool drinks and popcorn. 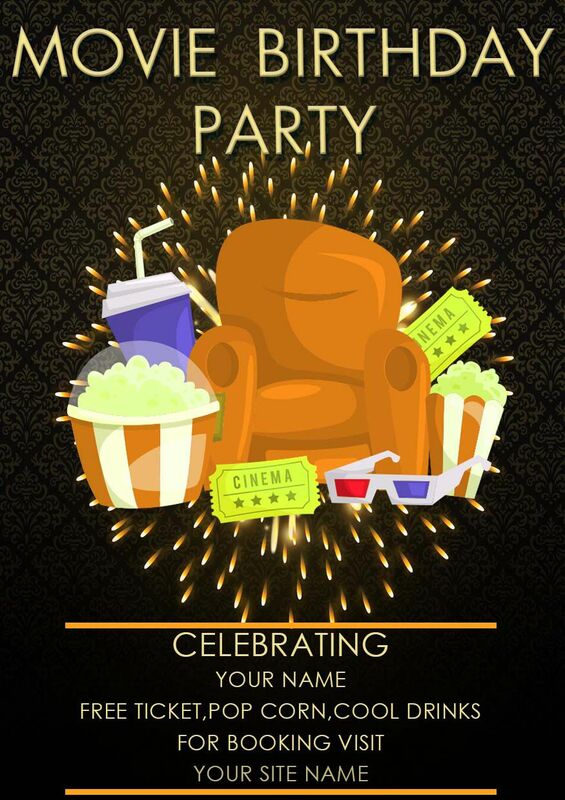 Bright black background with sparkling fire like a theme is aptly suited for a movie birthday party. The chair looks real and the 3D glass indicates that you are hosting a 3D movie night party. Let the guest have fun with coke and popcorn celebrating the birthday gala. 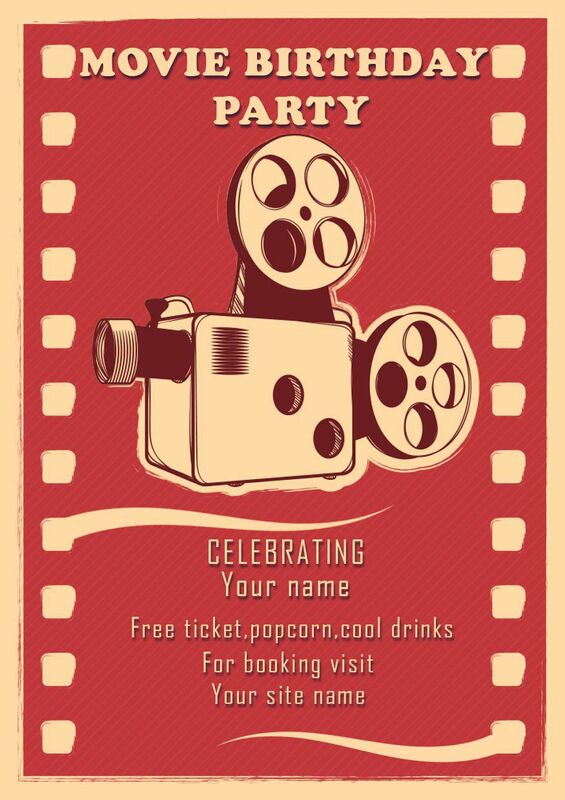 The traditional olden day’s movie-themed red background flyer can be used to invite your guest to join watching an old movie on your granny’s birthday party. The light colour text on a bright background gives a very great look to the poster. Wow, this flyer is really the best one with overflowing popcorn. The black and yellow theme is looking nice and the wordings can be written on both sides of the popcorn. The popcorn cup looks real and there you can feel glad about the black letters on the top adding more aptnesses to the situation. Use this flyer for a thriller movie night. The letters are written in 3D with iced coke, and 3D popcorns look This card is depicting a horror movie scene with the right color combination. Imagine the spill of popcorn from the cup as you watch the movie from the tip of the seat. Another elegant flyer for a cinema movie night. This one with a blue background and cute flowers gives an awesome The 5 golden starts are adding more vibrancy to the poster. 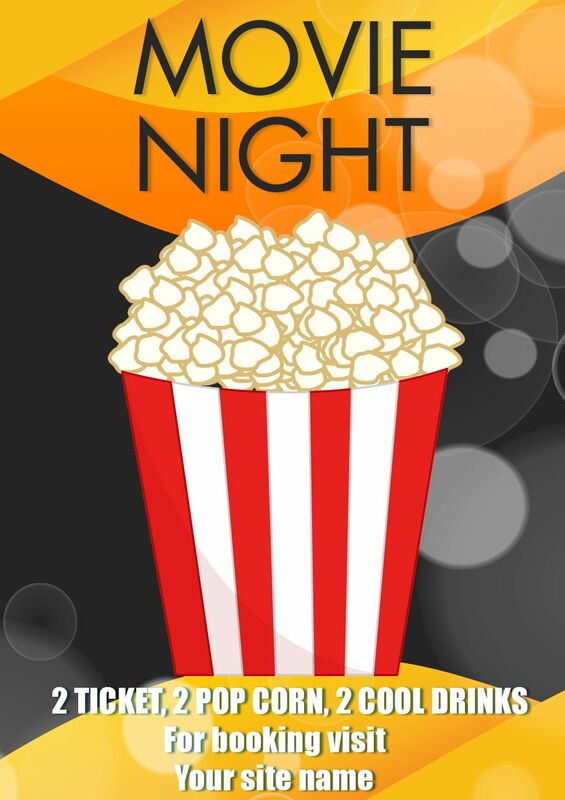 Edit this card and print the movie name to celebrate a great movie night. 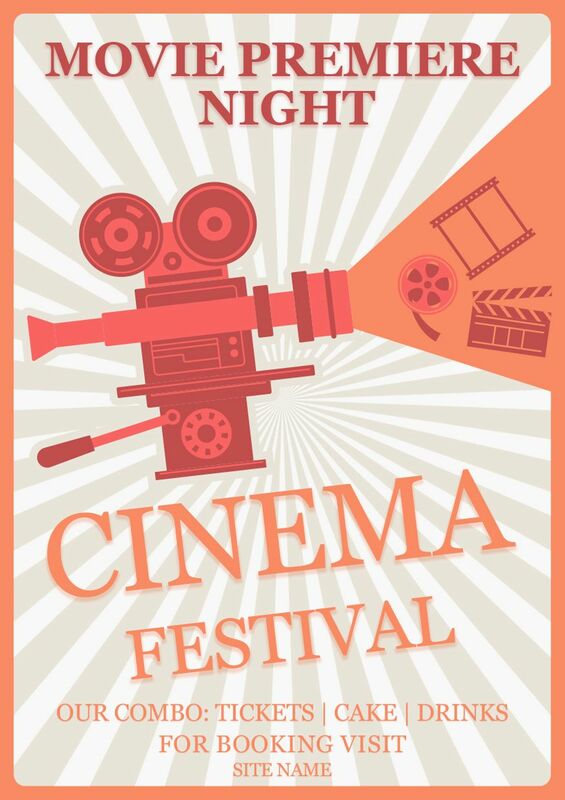 The flyer named movie premiere night written in bright red with a grey background is the right design. The film reel making the eyes and the arms altogether gives a true robot feeling. Those eyes will invite the entire guest home for a cinema gala. Yes, watching moving with kith and kin is a grand festival. 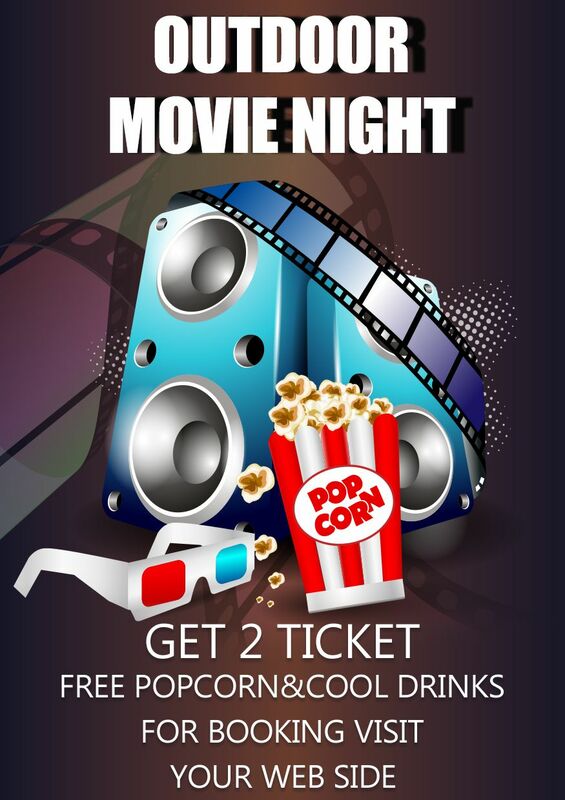 The movie night party flyer is coloured with a bright background and the 3D glasses are cool to look at. The film negatives, screen, reel box, and the entire design matched the theme truly. The wording colour is rightly chosen for the background and is printed in the correct font size. Unique flyer with a green backdrop and yellow/white alternating colour write-up makes this the flyer of the year. The way the images are lined up within the frame gives a professional look. The rainbow-coloured flyer with 3D writing is the speciality of this poster. The film reel with the camera stands on a tripod depicts the olden day movie making method. The printing party date and time can be edited to fill with details and yes it is purely a customizable flyer. 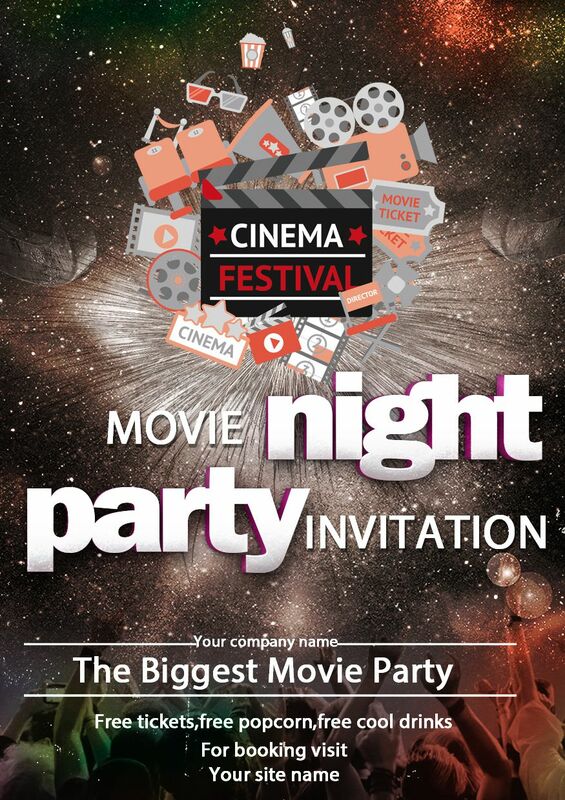 The biggest movie party flyer is made with a space theme. 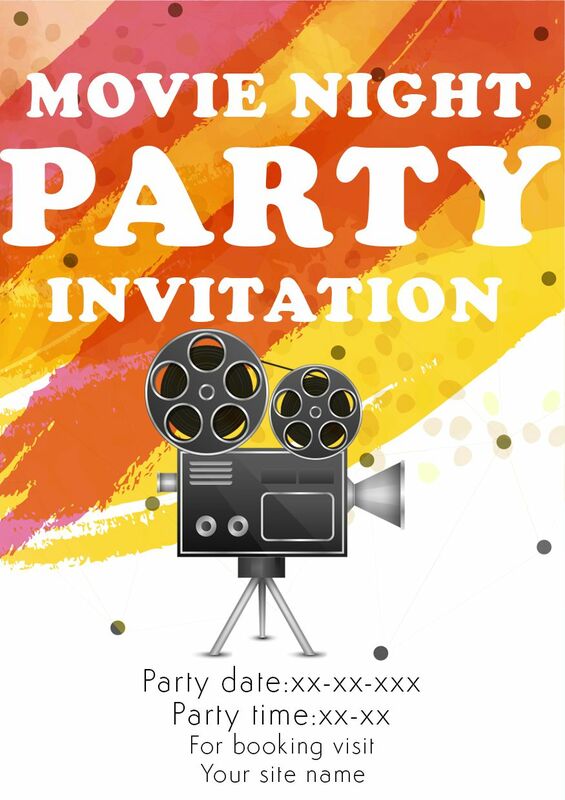 The colour combination reminds us of The 3D movie night party invitation invites us to make it a great celebration. Beautifully carved outdoor movie night poster has a great colour mixing. Yellow background and the red screen look good for a movie flyer. The flying tickets, coke, burger, and the popcorn remind the movie scene in our mind. When you look for an authentic movie night flyer and then opt for this one. The 3D images on the dark background look simply awesome. Watch the movie with the 3D glass to get a great effect. 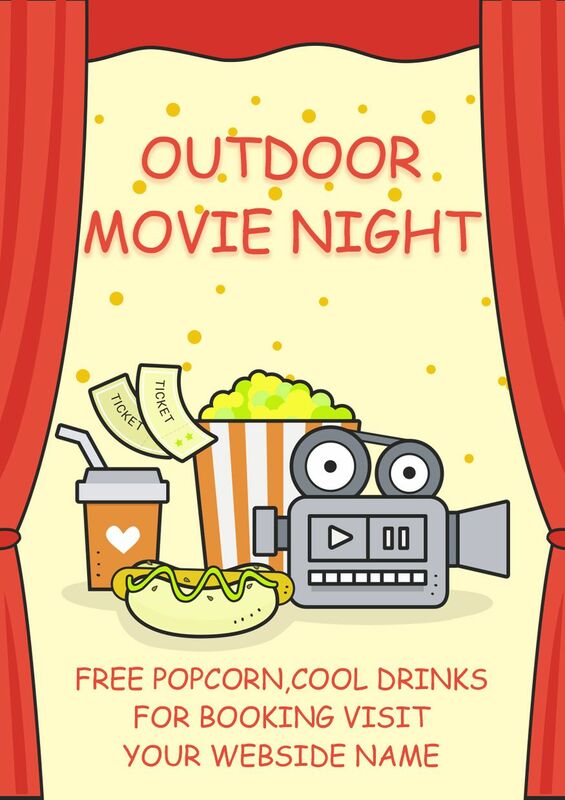 Use this flyer to invite for a thrilling outdoor movie night. 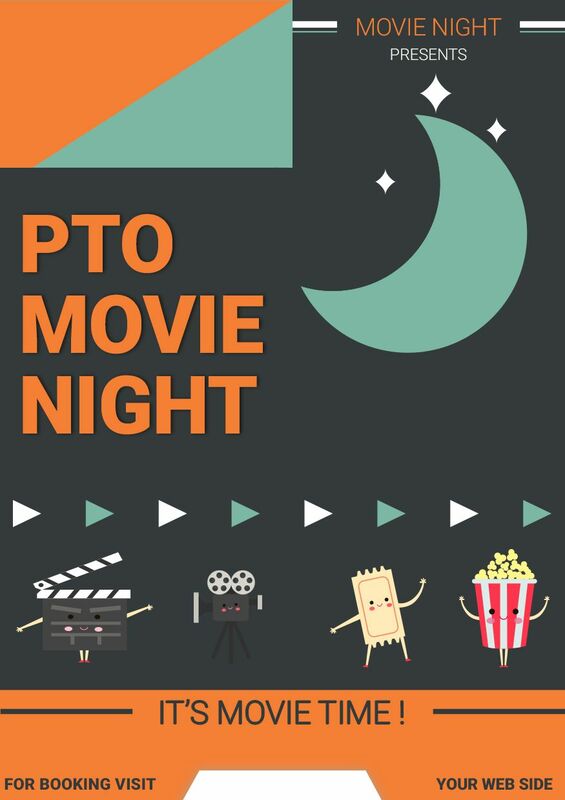 If you want to get parents along with the teachers, then PTO movie night is the best idea. The nice moon with twinkling stars is indicating the night movie an outdoor one. Look at those dancing popcorn and quickly download this flyer immediately. 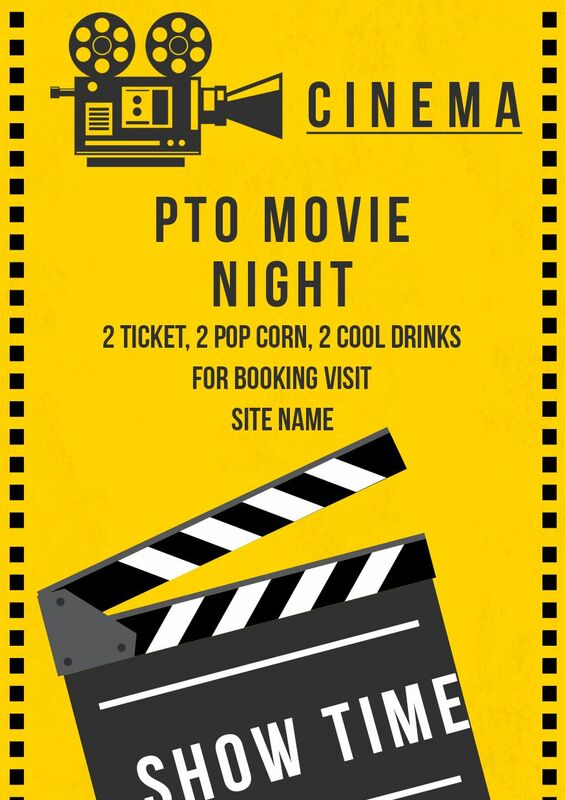 The yellow brightly coloured movie night flyer is another good one for a PTO movie night. Mention the show time by editing the show time wording on the poster. 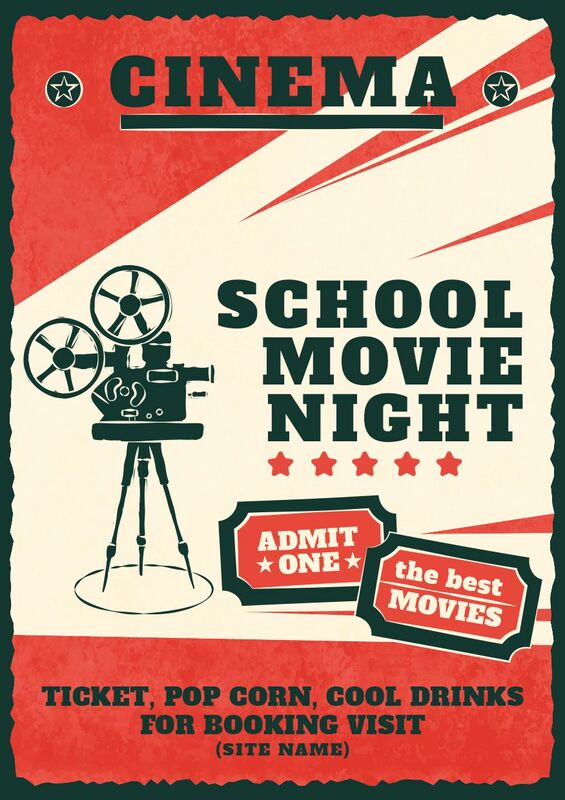 School movie night is a good idea to have children watches a movie in the school auditorium. Let them have fun together in a safe Use this red bordered flyer to have a great gala in school this year. 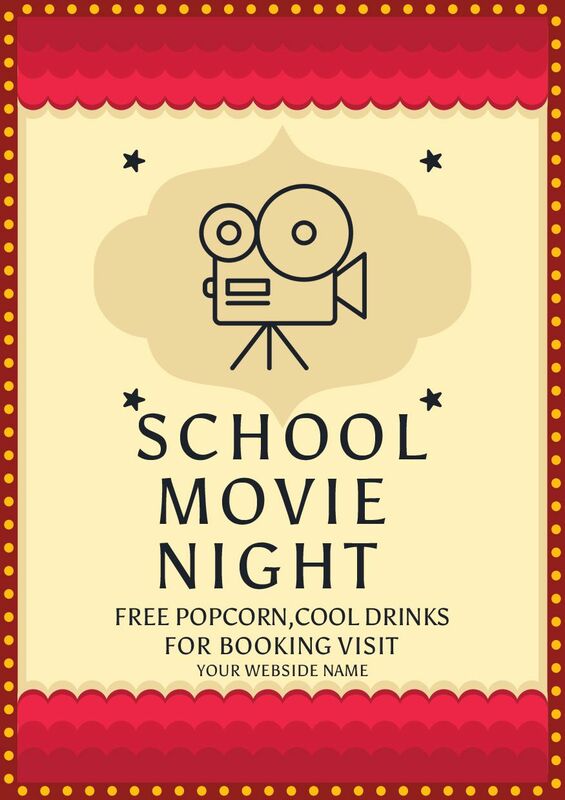 One more school movie night flyer which admits one student per ticket. 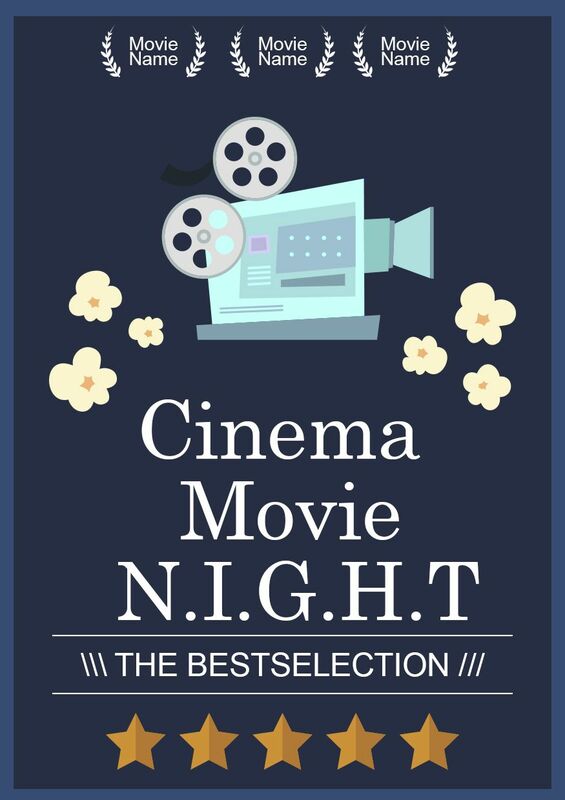 Send this invite to all students who deserve a movie night. You can use this as an appreciation to the best students who worked all through the academic year. Feel free to use any flyer and edit them per your need. Have fun!